During Michael Cohen’s Feb. 27 testimony, Republican Rep. Paul Gosar asked the former Trump lawyer and fixer about his legal duties to the president. “I’m sure you remember, maybe you don’t remember, duty of loyalty, duty of confidentiality, attorney-client privilege,” he said, implying that Cohen’s testimony was a betrayal of his former employer. It was the ultimate betrayal. I have spent the last nine months working on a book about the duties we owe to our employers and how they’ve changed over time. For me, there was something familiar – albeit extreme and repugnant – about Cohen’s initial loyalty and eventual public rebuke of the most famous boss in the country. The duty of loyalty is the idea that you should not cheat, rob, undermine or disclose the secrets of the person or entity you represent. This duty is especially strong for lawyers, because the acts they undertake on behalf of their clients are binding upon their clients, sometimes in life-altering ways. But the duty of loyalty also applies to most employees as part of their employment relationship. And the duty of loyalty is deeply embedded in both our legal and social fabric. In fact, New York still follows a legal concept known as the “faithless servant” doctrine, which allows companies to recover wages paid to an employee proven to have been disloyal. He didn’t end up taking a bullet. But he did incur a prison sentence for criminal conduct, some of which was done on the president’s behalf and, according to Cohen, behest. We’re in a weird time when it comes to our relationships with our employers, which, like Cohen, reflect strong attachment and loyalty. At a time when trust in many institutions – like the federal government, the church, the medical system and the media – is quite low, Americans trust their employer above all. A survey by the Edelman group found that 80 percent of the Americans they surveyed trust their employer, and at higher rates than many countries in Europe. Americans have also been staying with their employer longer, rising from a median of 3.5 years in 1983 to 4.6 years today. We also tend to worship work, as Derek Thompson recently wrote for The Atlantic. Millennials, despite their reputation, place almost as much trust in the workplace as baby boomers. The internet is replete with content evangelizing productivity hacks, work inspiration and the promise that waking up at 5 a.m. to answer email will be the best thing you’ve never done. Yet we are also witnessing a countervailing trend – a broader cultural acceptance of those who speak out publicly against their employer. In the 1980s, few state courts offered protection for whistleblowers who exposed wrongdoing at work. Now most states do, and there’s a similar trend at the federal level. Courts and politicians are likely following a cultural shift. And with it comes a grudging recognition that whistleblowers – even one as tainted as Cohen – are imperfect, and may be compromised in numerous ways that color but do not necessarily cancel out the public function of their disclosure. Consider, for example, Edward Snowden, the former National Security Agency contractor who leaked highly classified information about government surveillance, and fled to Russia. Snowden comes nowhere close to fitting an idealized image of a whistleblower, and he may very well have violated the Espionage Act. Yet a 2013 poll found that more than half of Americans across the political spectrum considered him a whistleblower. The increased latitude we give whistleblowers is also visible in the whistleblower bounty in the Dodd-Frank financial reform statute. Under the law, whistleblowers get to share up to 30 percent of the amount the U.S. Securities and Exchange Commission recovers for securities fraud. Americans have, apparently, made peace with the idea that someone with a selfish motive might still have useful information. Perhaps, as some Republican lawmakers argue, he is just a “pathological liar,” with a record of criminal conduct entirely unrelated to the president. 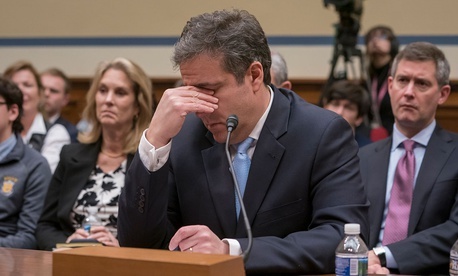 But perhaps Cohen is an exaggerated – and highly unflattering – portrait of our noncriminal loyalty to our less famous employers. In other words, the grand public betrayal is made possible by our excess of loyalty. After all, Cohen wouldn’t have had so many secrets to spill had he not been devoutly loyal to Trump for so long.